From Canada's Constitution Act of 1982 the Charter of Rights and Freedoms guarantees the rights and freedoms set out in it subject only to such reasonable limits prescribed by law as can be demonstrably justified in a free and democratic society. And according to section 2(b) of the Charter this includes freedom of thought, belief, opinion and expression, including freedom of the press and other media of communication. 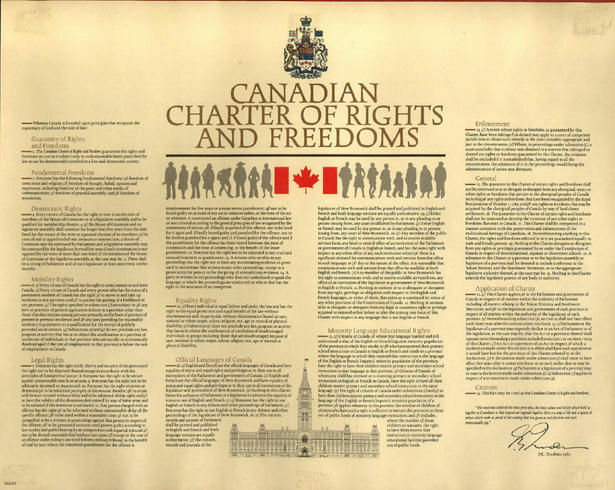 The Canadian Charter of Rights and Freedoms is actually quite young. It was originally signed by Queen Elizabeth II and Prime Minister Pierre Elliott Trudeau in 1982, after several drafts and revisions to the original 1980 document. Section 2(b) which has been the subject of a large amount of case law is considered by many to be the most significant of the Charter rights in influencing Canadian society. Justice Peter Cory , who served with the Supreme Court of Canada from 1989-1999, once said "it is difficult to imagine a guaranteed right more important to a democratic society." While this is all very heady stuff it is important to understand that freedom of the press is not some catch phrase snatched from the movies. Freedom of the press is an absolute necessity if we are to hold governments and agencies accountable, inform and entertain our communities, expose inequity and injustice in all forms, document events for the historical record, and inspire thought and creativity for the betterment of society. In the twenty-four years that I have been working as a staff photographer in Canada I have witnessed the escalation of a troubling trend by people of authority to limit and/or impede the work of legitimate journalists and photojournalists with little or no legal justification. There was a time when police tape was used at crime or accident scenes to control crowds, allow emergency responders space to do their jobs, and maintain public safety. These are all legitimate reasons for controlling a perimeter. However, many journalists you ask today will tell you that police lines(to use a general term not limited to police), have steadily moved further and further away from the scenes they are meant to protect. Many emergency services come under the scrutiny of media during the execution of their duties. It is no small wonder that over time authorities have discovered that by limiting media's access they are also able to avoid scrutiny of their own roles. The dreaded yellow tape that marks off areas where emergency personnel are working is often used to define the point that media cannot cross. It is quite common for police to control media in this way while citizens stand, or walk well within the limits of the yellow tape. It begs the question as to which of reasons for placing yellow tape is being addressed. While civilians are free to wander within police lines then certainly the incident scene is not being protected, nor is public safety. In addition, most media understand all too well how to work in close proximity to emergency personnel without getting in the way. I'm not sure that most civilians can say the same. When a neighbourhood barbecue turned violent and several people were shot in Toronto last year, there were hundreds of yards of police tape strung throughout the neighbourhood. Media did what they could to do their jobs from outside of the taped area, while some residents wandered around inside the tape within feet of where cones marked evidence found by investigators. When some media tried to access a part of the street (outside the tape) from which it was possible to view an area where police were visible conducting their investigating of one of the fatalities, officers quickly asked them to move away, and the tape was moved to prevent the effort from being repeated. Why would they do this? It is no secret that many in society do not understand how or why we do our jobs as visual journalists, and it is often painfully obvious that many police officers and other emergency personnel do not approve of what we do. This is irrelevant when it comes to our rights as media representatives performing a legitimate role within the confines of the law. But it is the reason, this and self-preservation, that people of authority use their authority, lawful or not, to make it harder for us to work. Only law can limit a Charter right. A police officer cannot limit a Charter right on his or her own initiative without any authority in law. Nobody can limit the rights of the media simply because they don't like or agree with what we are doing or how we are doing it. But police are not stupid by any means and it is this manipulation of the law that they use with great effectiveness. Take for example the case of Toronto Star reporter Alex Consiglio who was arrested after taking photographs of an injured GO transit officer at Union Station in Toronto. Anne Marie Aikins, media relations manager with Metrolinx, was quoted in the story as saying that news photographers are not allowed to take photos at Union Station. “There are two issues here. If you’re taking pictures in the official capacity of your job (journalist) that’s where there is a liability issue. If people are using their cellphones and taking pictures or even using their cameras to take tourist shots there isn’t that kind of an issue because it’s not in an official capacity,” said Aikins. If I'm understanding correctly then, the problem isn't the act of taking photos, but rather the idea that something unapproved by GO might end up in a media publication. So in practical terms, it's okay to take photos, unless you're an actual accredited, working journalist. The moments that followed Consiglio being asked to stop taking photos are indicative of a tactic quite common with police. While we may not agree with an officer's reasons for asking us to move back from an area, and while the request may actually be difficult to justify legally, the bottom line is that once you disobey that request you are providing police with the opportunity to arrest you, which is pretty much what happened with Consiglio. In fact Consiglio says he did move away when directed to do so, but apparently didn't quite remove himself completely from the property. It is very common today for police, security personnel, etc. to tell unwitting members of the public, and the media that they cannot take photos. The reality is that there is absolutely no law against taking photographs in Canada. There are trespass laws, and you can be quite lawfully asked to leave a property, but the act of making pictures is not illegal. You know you've struck a nerve when a police officer approaches you and tells you to move away because "you've taken enough pictures." It is neither their right, nor their place to determine when you may or may not photograph or videotape a scene. Their own personal sensibilities, fears or judgments are irrelevant to the situation and the rule of law. Wether lawful or not, the next step is that the officer will ask you to move back. At this point they are taking a perfectly lawful situation and placing you at the mercy of the law as they interpret it. If you resist at this point, media or not, you may be arrested. It is wrong, it likely won't stick in court, but it certainly solves the problem for the police officer at that moment. Another situation we come up against regularly in Toronto is access to TTC property. The Toronto Transit Commission is paid for by the taxpayers of Toronto, is run by the government body in Toronto, and is largely a public space. Individuals take photographs and video regularly on TTC property, yet the TTC insists that the media need permission to work on TTC property. There is no legal justification that I have been able to find for this, yet Toronto's media for the most part tolerates it. At Toronto City Hall I was recently told I could not take photographs from the public seating area. This, despite the fact that the area was mostly empty. The security guard, and the civil servant with him, were of the opinion that I needed to work from the media designated area. The security guard actually admitted to me that if I was a member of the public I would be allowed to continue photographing from the public area, but because I was with the media I had to move. The thinking is so obtuse that I can hardly believe it happened to this day. It is convenient that an area is set aside for media to work in, but it is exactly that. It is not intended to be a place to sequester the media. Situations like these have become all too common. Police tape and bogus rules have become a way to control media access, and media are increasingly being targeted. In a 2010 story by Lise Lareau, for the Canadian Media Guild she describes several cases of media carrying formal G20 media accreditation who were kept from doing their jobs, several of whom were beaten, arrested, and detained. What appears to be happening is that the messengers are being targeted by authorities rather than authorities concentrating on the events that are being covered. “This kind of behaviour by police toward the media is not acceptable in a democracy like Canada,” said Mary Agnes Welch, president of the Canadian Association of Journalists. “Police must understand that, like them, journalists have a job to do in the public interest. Lumping us in with protesters or blocking us from covering events is not consistent with the democratic principles that police are sworn to uphold. The CAJ has received word from professional journalists who say they have been threatened with arrest if they did not leave an area where they were covering peaceful protest, witnessed officers striking journalists and seen colleagues arrested." I'm of the opinion that it doesn't matter what the nature of the protests were; peaceful or not. Media were doing their job, and were singled out because they had eyes on a scene that were unwelcome at the time. Police asked them to leave, and the minute they refused they became vulnerable to arrest. The post G20 fallout was minor, but was the most appropriate time in recent history for Canadian media to move en masse to change this rising tide of media crippling. It has become increasingly obvious that there are those in positions of authority that have adopted a warped sense of the democratic principals that they have been sworn to uphold. We all take great pride in reporting and documenting with care, and publish our work with great consideration for every subject, victim, and reader. It is absolutely wrong for law enforcement, as individuals or collectively, to manipulate, or misrepresent the law, to strip Canadian citizens, media or not, of the rights that our lawmakers have guaranteed us in the spirit of a true democracy. This landslide of abuse needs to stop, and it will only stop when organizations, lawmakers, and citizens stand up together and say "Enough!"